Here’s another pictograph panel I visited over the holiday weekend. I’ve been waiting for the Salt Creek Road to open up for a while, but the weather just has not cooperated, so I decided to finally hike to Peekaboo. 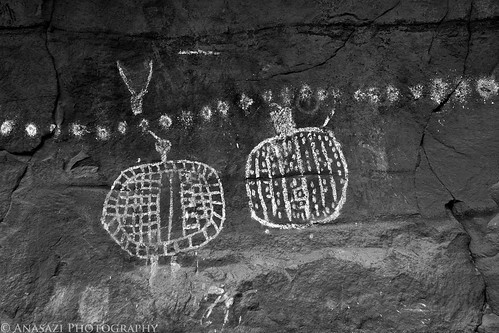 I thought that this photo of the Anasazi shield-like figures looked good in black & white. If you look very closely, you can see the very faint Barrier Canyon Style figures that these were painted over.